NOWs: homecomings 1, 2, 3, etc. homecomings 1, 2, 3, etc. Inspired by Georges Perec’s Espèces d’espaces (Species of Spaces, 1974) and Hreinn Friðfinnsson’s House Project (1974–), homecomings 1, 2, 3, etc. revisits, through varying means of translation, spatial and conceptual loci of homecoming within artistic practice. 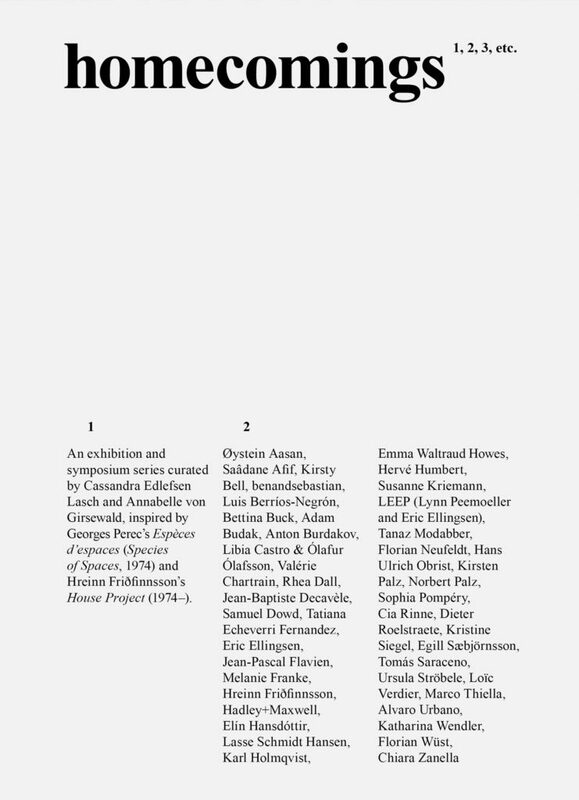 The exhibition and symposium series, homecomings, from which this publication stems, draws its principle inspiration from the architectural and linguistic returns and repetitions punctuating artist Hreinn Friðfinnsson’s House Project (1974–) and author Georges Perec’s Espèces d’espaces (Species of Spaces, 1974). In 1974, through an ephemeral gesture, Friðfinnsson claimed the whole universe within the site of a small house, turned inside-out, in the middle of an Icelandic lava field. Encountered only through happenstance or hearsay, a timeless lore grew around the house. House Project became a resonating series of works, appearing in multiple iterations, inversions, and reductions in form. Also in 1974, Georges Perec set out to approach the topic of space, creating a telescopic “journal of a user of space” by layering deliberate and protracted observation with writing constraints and wordplay. Perec starts with the page and zooms outward to space itself, always mirroring and reflecting the influx of the everyday in his call to read and reread surrounding spaces. Testing the concept of “homecomings” against a number of artistic practices, this volume grows out of an imperative to act according to the referentiality hallmarked in the conceptually rigorous works of Friðfinnsson and Perec. homecomings 1, 2, 3, etc. opens a flood of personal wellsprings, where no two connotations align perfectly. The collected contributions oscillate between self-referential modes—creating full-circle loops within singular practices—and far-reaching trajectories, gaining momentum and associations upon every rereading. Like Perec, many works call for an attuned presence, and in so doing, proffer a homecoming at the very site of reading. CHANGING ROOM / Wedding: is a new project space focusing on sound art and performance. The programming consists of interdisciplinary projects based on sound art, speech/voice, and movement and offers talks, performances, and deep listening sessions on a regular basis. CHANGING ROOM is situated in a former horse stable on Lüderitzstraße in Berlin Wedding’s African Quarter, which will soon be renamed to Cornelius-Frederiks-Straße.